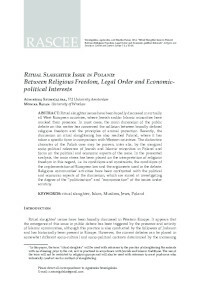 Ritual slaughter issues have been broadly discussed in virtually all West European countries, where Jewish and/or Islamic minorities have marked their presence. In most cases, the main dimension of the public debate on this matter has concerned the collision between broadly defined religious freedom and the principles of animal protection. Recently, the discussion on ritual slaughtering has also reached Poland, where it has taken a specific form in comparison with Western countries. The distinctive character of the Polish case may be proven, inter alia, by the marginal socio-political relevance of Jewish and Islamic minorities in Poland and focus on the political and economic aspects of the issue. In the presented analysis, the main stress has been placed on the interpretation of religious freedom in this regard, i.e. its conditions and constraints, the conditions of the implementation of European law and the arguments used in the debate. Religious communities’ activities have been confronted with the political and economic aspects of the discussion, which are aimed at investigating the degree of the “politicisation” and “economisation” of the issues under scrutiny.